What has Religion got to do with it? As the Nigerian general elections draws close, one wonders…does the average Nigerian have certain criteria that influence their vote or is voting hung on the cliche assumption of geo-political zones and religion? This post explores views on various components of governance based on a survey “My Nigeria; post-2015” using sample population on social media. Governance has various aspects, and there are some that are more important to people more than others for obvious reasons. Despite the political instability in the country of late, a majority of the respondents indicate that they will be exercising their voting power, while fifty percent were already decided on their choice of candidate (My Nigeria; post-2015). Naturally, Nigerians seem to be concerned first and foremost about corruption and the capacity of the government to deliver on key needs and expectations in areas such as economic management, transparency in governance, access to basic needs, job creation, growth stimulation, education and security. And ranking low are freedom of religion and political participation, gender equality and support for the society’s vulnerable etc. Evidently with the recent events of mismanage ment and disappearance of funds, corruption is an essential part of the concerns for Nigerian voters, since it has such a big impact on people’s satisfaction with their governments and their perceptions of its performance overall. However, the basis upon which the electorate decides on the preferred candidate’s or party’s ability to tackle or minimize corruption is unclear. This is so because more often than not, candidates and political parties in Nigeria are largely vague in this regard. Surprisingly, very few Nigerians are interested in political and religious freedom, while other liberties such as human rights particularly of child-abuse/protection and other human rights issues such as gay rights are still somewhat a taboo subjects among Nigerians. Other governance dimensions, specifically those associated with political freedoms are also vital but they remain decidedly of secondary concerns. Perceptions of governance are instrumental: people tend to value political freedoms and democracy mostly in relation to how democracies perform and whether they successfully meet the expectations of the people. This can place democracy under considerable strain, especially in countries across the developing world where the ability of governments to respond to citizen needs remains weak. As such, the question of how Nigeria’s blossoming democracy can be supported to improve the well-being its population is therefore essential, with important implications for advancing governance to achieve desired outcome of the voters. My World, an innovative global U.N. survey on people’s priorities for the future. The survey asks respondents to select their top six out of 16 possible development priorities for the future that would make the most difference to them. This survey is timely as it corresponds with the general upcoming election in Nigeria. Of these options, very few respondents prioritized “political and religious freedom”,” which ranks second to the last, behind central concerns such as corruption, transparent and open government, education, human rights protection, and jobs. Other governance-related options lag considerably behind, particularly factors associate with inequality either of class, gender or ethnicity. Certainly My Nigeria-post2015 only provides a snapshot of what matters the most to Nigerian electorates, and does not reveal much about why they vote the way that they do however, it does reveal a consistency in factors crucial to the Nigerian voter in our upcoming election. Comparing this result to a more detailed survey; afrobarometer which covers larger samples of polling data from other emerging nations in Africa, Asia, Latin America, and the Middle East, revealed a strikingly similar picture across surveys on what dimensions of governance people value more, and important insights can be drawn from those results. Additional, the afrobarometer reveals that factors such as, gender inequality and religious and political freedom are still very sensitive topics across board, however, gaining momentum across Africa; as people are beginning to debate the supremacy of religion on issue of the girl-child marriage and the criminalisation of gay citizens. Laws and practices such as criminalizing homosexuality and child marriage are heavily hinged on religion. Remarkably, one is a consensual act by two consenting adults while the other is an imposed act usual by an adult to a vulnerable citizen (girl-child) both whom should be protected by the state as indicated in the Nigerian constitution. Recently, the issue of child marriage came to light globally as a Nigerian serving senator insisted he was well within his rights as a Nigerian Muslim to marry his fourteen year old bride. Strikingly, the Nigerian constitution states the adult age to be 18 while concurrently giving supremacy to the sharia law which permits such acts. Raising the question “should religious precedence be supreme to the constitution on certain issues? Such a question is valid because of what use is it for a constitution to declare adult age as 18, if certain children can be married off to men and it is ok because their religion permits them to. Further, the same constitution which should protect ALL citizens regardless of their religious beliefs permits the imprisonment of consenting adults for their choice of sexual partner just because it is offensive to cultural and religious practices. This survey was designed to test the sensitivity of the sampling population on the taboo subjects evolving in the country. What is apparent is, Nigerians are less concerned about human rights, inequality and welfare issues rather other central issues are more important and our governance system is not yet equipped to deal with these sensitive issues. Nigeria is a secular state with Christians, Muslims, idol-worshipers, atheists and humanist, hence, such laws and practices is serving an intolerable population whose aim is to control others is based on their personal belief and the most popular public opinion. 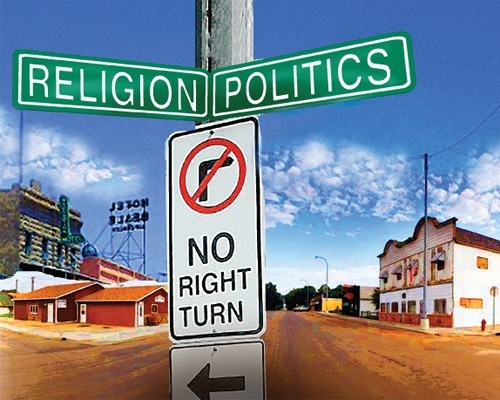 Religion continues to play a crucial role in influencing our choice of vote, yet is often down-played in discuss on issues that affect our politics and development. Because Nigeria is governed by neither the bible nor the Koran as such, the ideal would be rid of religious connotations to enable electorates vote for the capable leader and not one associated by a particular faith with the fear of such preference hindering their religious practices. As much as we love to ignore this; in our upcoming national election, votes will be highly based on religion and ethnicity or geo-political zoning. This is so because citizens want to protect their interest, freedom and fear of what ethic group controls the resources regardless of the capacity to perform. Laws and policies should be free from any form of religious, cultural or geo-political preferences if we are serious about changing how Nigerians vote in a free and fair election. Christians will feel threatened by discussions of Nigeria adopting Islamic banking as raised by the former CBN governor; the idol- worshipers, homosexuals and vulnerable girl-children who happen to be Muslim will continue to feel let down by their constitution which doesn’t protect their right as citizens of Nigeria. The notion that the lack of religious and cultural imposition is hurting our society fails to acknowledge what advancing democracy entails and other factors associated with globalization. For example, the exposure to western education is raising new sets of citizens who regardless of their religious and cultural beliefs are more incline to universal child-protection laws, freedom of speech and sexual preference and tolerance for others. It almost seems as though the Nigerian society wants to pick and choose factors associated with growth, globalization and development. This debate will continue and I believe an on-going controversy in Nigerian politics. This finding has an important implication as it reinforces vital issues often overlooked or discussed in very subtle manner. Nonetheless, the growth and appreciation of a democracy is linked to how democratic systems perform in service delivery and the protection of its citizen’s right. Nigeria is highly divided by ethnicity and religion yet, it remains a taboo subject for discussion. Here, overall, assessments is as expected less positive, but gaining momentum. This entry was posted in Africa, Politics and tagged #culture, #Globalization, #HumanRights, #Religion, Governance, Nigeria. Bookmark the permalink. 1 Response to What has Religion got to do with it?